← Philip Zhai: Read his poems in Chinese here! It is 31st of December 1999 on One Terabyte of Kilobyte Age, the last hours of the last century. Apart from the page above and common Y2K jokes, nothing reveals that the world is on the age of algorithmic catastrophe. 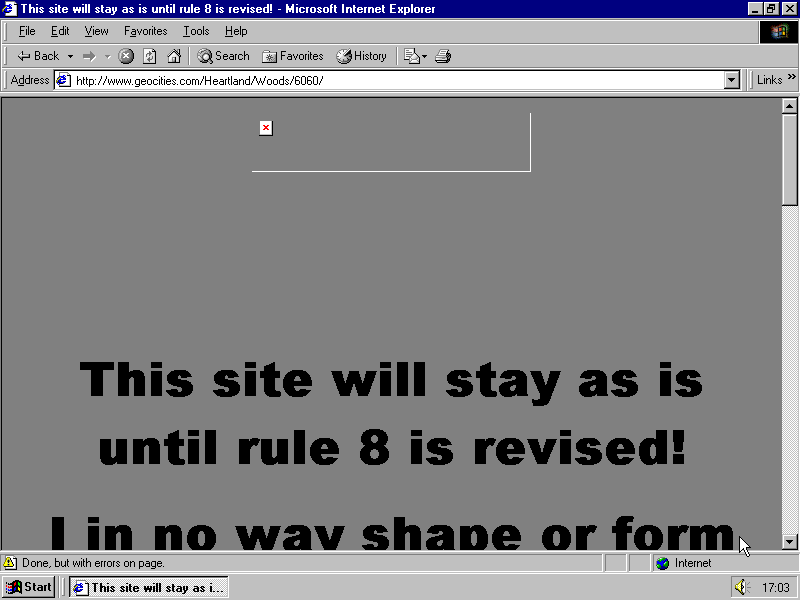 As usual, people moving in and moving out of GeoCities. 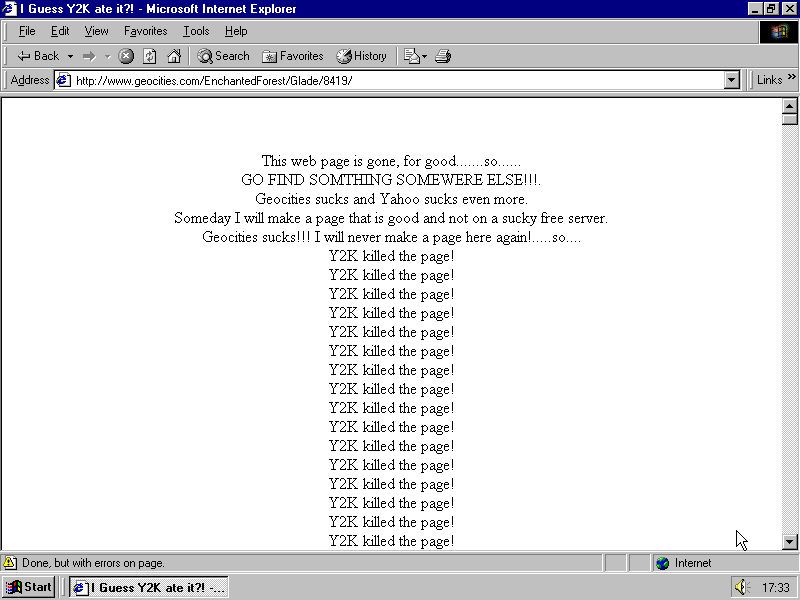 Revisiting my preview I now notice that I didn’t mention and didn’t think about the most important thing that happened to GeoCities users that year—the acquisition of the service by Yahoo!. Indeed, although the deal took place already in January, there were no visible traces of the new owner until the end of June, when Geocities/Yahoo introduced the new Terms of Service. Its Section 8 suggested that all the content users host on Geocities belongs to Yahoo!. Apparently in 1999 internet users still read Terms of Service agreements. This one got them furious and initiated very vivid actions in protest of Section 8. The protests were fruitful and the ToS were rewritten. Among the changes Yahoo! brought along were vanity profiles: they discontinued the virtual city structure and severely affected GeoCities’ community spirit; and the Yahoo! Site Builder, whose aim was to make home page creation easier and self expression more organized. I think both changes were going hand in hand. To make it short, it was the Template replacing the URL. Before, if you wanted to make a let’s say Backstreet Boys fan-site, you would most probably go to the SunsetStrip neighbourhood, now you could choose whatever name for your production and a proper template. 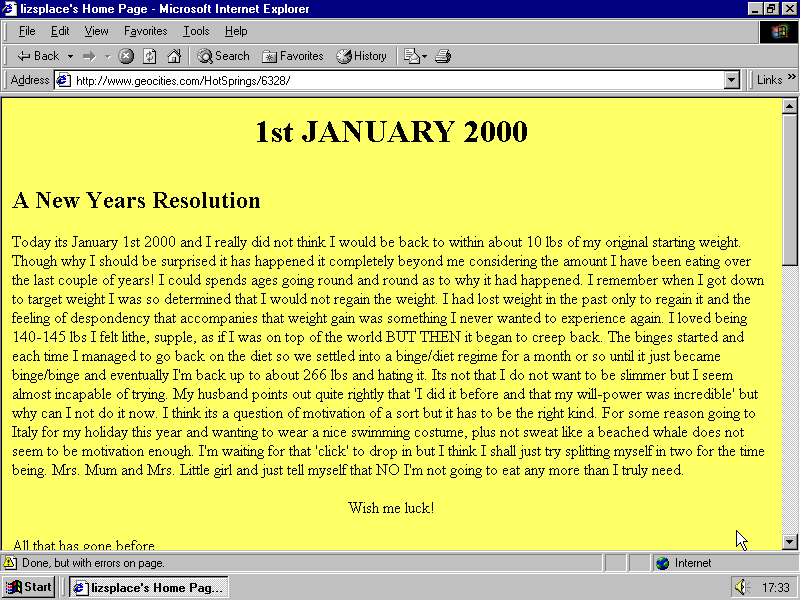 Yahoo templates for personal, business, fan, “meet my pet”, “it’s a girl”, geek and so on occasions came to my attention as soon as I peeked into the Geocities archive. It was also clear at first sight that nothing could compete in popularity with the default Page Builder template — Personal Page Blue. I wrote about this phenomenon in 2011, but it is now when I go one by one through the pages updated in the last quarter of 1999 that I can feel how people tried and failed to make sense out of this structure. 8 of the latest 300 abandoned pages are somebody’s sad attempts to squeeze themselves into the template. 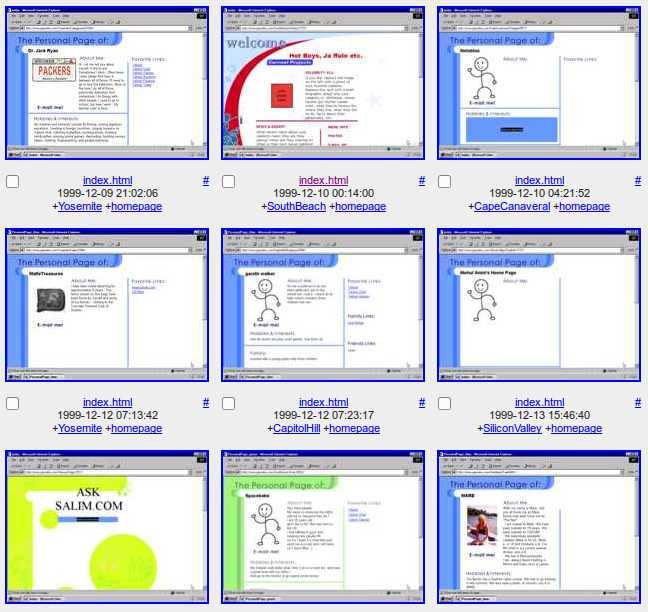 At the same time, Geocities again and again proves to be an indestructible time capsule. Look at our newest projects: BSB heaven, Area 51, On the Internet Everybody Knows You Had a Dog, Ruins restored. They are largely based on the material of pages last updated in 1999, but if you can remember, the web didn’t really look like this 1999… outside of GeoCities. P.S. As for Yahoo!, they were not sitting and twiddling their thumbs, we have seen two new actions last year: the removal of clipart libraries and paid users’ pages that were still there. And they shamelessly redirect addresses of killed pages to a site that promotes their Small Business Hosting Service.